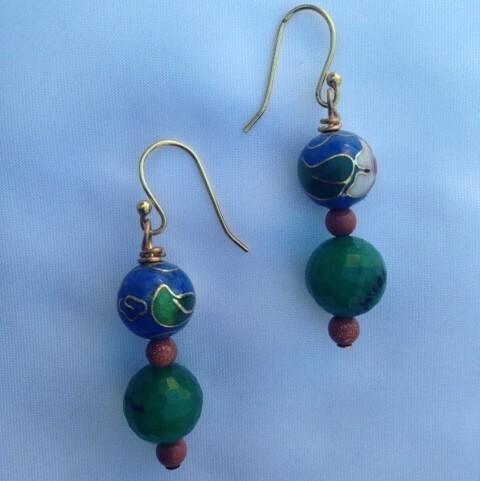 A simple but beautiful pair of earrings made up of periwinkle blue cloisonné beads, green jade and tiny goldstone beads. Green Jade: This is considered a very lucky stone – it instills resourcefulness. It is connected with love and virtue. This stone is known as the “fidelity stone” – it balances energies between self/partner and opposing energies in both the internal and external domain of one’s reality. It promotes peace and harmony, soothes energy. It assists in finding wisdom for problem solving. Goldstone: A manmade stone rich in copper. It activates root and sacral chakras enhancing the energies of intuition, sexuality, desire and vitality. It illuminates the spirit. Goldstone encourages faith that love is attainable once all limiting beliefs are released. It also acts as a mood stabilizer on either spectrum-excitability or passivity.